For some reason I never built an Honest John rocket model when I was a kid. I always liked the design and the look of the nose cone. Both Estes and Centuri made versions of the Honest John. 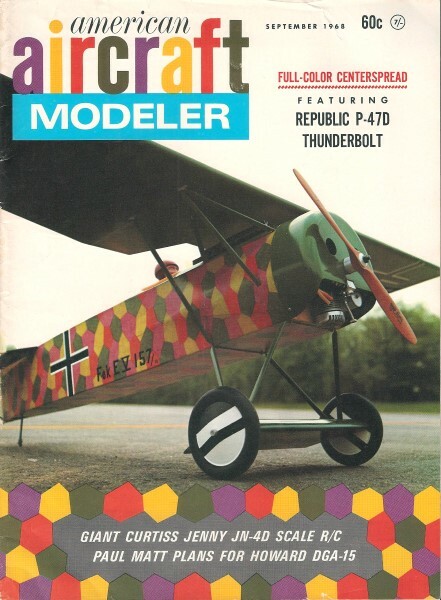 Intentionally or not, there was an advertisement for the Centuri Honest John model on the page opposite of the past part of the article in this September 1968 edition of American Aircraft Modeler, from which this page (begins on pp 40) was scanned. Scale data, for use in model rocket competition, on the Army's first unguided artillery rocket. 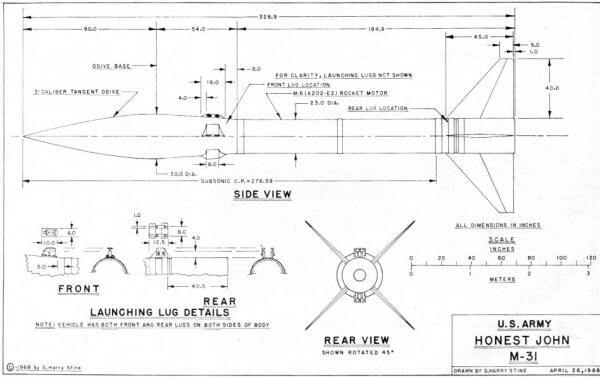 This information on the U. S. Army's Honest John M-31 artillery rocket provides astromodelers with scale substantiation da­ta required under U. S. Model Rocket Sporting Code, 1967 Edition. It enables use of scale model Honest John kits by both Estes Industries, Inc. (Kit K-27) and Centuri Engineering Co. (Kit KC-25) for com­petition. The Estes H-J kit is to a scale of 1:23.56; the Centuri H-J kit is to a scale of 1:25.33. The basic dimensional data on the M-6 (X202-E2) rocket engine can also be utilized for scale models of those NASA rocketsondes using the M-6 - EXOS, Jason, Javelin, etc. Author's Honest John is very colorful with fluorescent red-orange, white and black. It has held U. S. Class 2 Scale Altitude record and won NARAM-6 and 7 scale events. H-J development round No. 1236F-M173 on the fixed-development launcher at White Sands Proving Grounds, New Mexico. Upper left fin is all black, other fins are white. The honest John M-31 was the U. S. Army's first surface-to-surface unguided rocket intended for use as a long-range artillery weapon. It consists of a nuclear or high-explosive warhead mated to a large solid-propellant rocket motor. It is an unguided rocket depending for stability in flight on four large fins. Its trajectory is pre-determined by the azimuth and ele­vation of its 25-foot launching rail which is mounted on a truck for mobility. Eight small solid-propellant spin rockets located in four shrouds behind the warhead sec­tion in the nose are triggered by a mechanical trip at the end of the launching rail and impart a slow roll to the missile in flight to average-out fin and thrust misalignments in order to improve accuracy. Honest John is a large artillery rocket capable of delivering a 2000-pound warhead at distances up to 15 miles. It is now considered obsolete, having been replaced by the smaller Little John rocket and the Lance rocket. Development history: The Honest John's M-6 (X202-E2) solid propellant motor was originally developed under the Bumblebee Program of the Applied Physics Laboratory of John Hopkins University under contract to the U. S. Navy Bureau of Ordnance (BuOrd). It was intended to be used as the rocket booster for the ramjet-propelled XSAM-N-6 Talos ship-to-air antiaircraft missile, but was later replaced in this use by an improved solid propellant booster of larger diameter and shorter length. 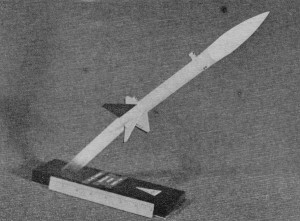 In 1950, U. S. Army Ordnance Corps carried out some preliminary experiments at White Sands Proving Ground, New Mexico, mating solid-propellant JATO (Jet-Assisted Take-Off) rockets to inert warheads and stabilizing fins to investigate the possibilities of creating an inexpensive battlefield artillery rocket for close fire support. The successful completion of these experiments led to the Honest John in which the available M-6 (X202-E2) solid propellant ex-Talos booster 23 inches in diameter was mated to the 30-inch diameter special warhead available from the Sandia Corporation's Special Weapons Laboratory. The first Honest John was launched from the Army Launch Area #1 at White Sands Proving Ground on June 30, 1951. The author was present, standing on the roof of a truck 1000 yards due west at Uncle Station. 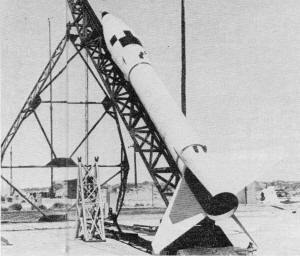 The "H-J," as the missile came to be known at White Sands, surprised nearly everyone with its exceedingly high noise level that was much greater than the German A-4 rockets then being flown at White Sands. It was the first time this booster, the M-6, had been fired at White Sands, previous flight tests in the Bumblebee Program having been conducted at the Naval Ordnance Test Station, China Lake, California. Full mass production of the Honest John was started in 1952. Douglas Aircraft Company was the prime contractor with Radford Arsenal manufacturing the M-6 CX202-E2) rocket motor. At the time, the M-6 (X202-E2) motor was the largest production solid propellant motor in existence in the free world. From 1952 through 1957, hundreds of Honest John rounds were launched at White Sands Proving Grounds for various purposes. Initially, launchings were made to determine the battlefield range tables - the trajectories followed by the H-J as a function of launcher elevation, wind velocities, and temperatures. Early firings were made from trussed-rail-type launchers in the Army Launch Area #1 at White Sands, and launchings were usually made two at a time with three minutes between firings. Later, firings were made from the tactical mobile launch trucks with their 25-foot launch rails. Test firings were also made from shortened truck rails. One modification of the H-J was the "Father John" missile, basically an H-J with additional small solid propellant motors clustered around it. Only a few Father John missiles were flown. Considerable trouble was experienced with the quenching of the huge cloud of dust and smoke kicked up by the launching of an H-J. The tremendous jet blast from the missile created a thick cloud that rose as high as 1000 feet in the air. Such a cloud would reveal an H-J launch site to the enemy at once and probably result in making said launch site a prime target for enemy artillery at once. Naturally, the technique of preventing such a cloud is highly classified! By 1957, the Honest John M-31 was operational in the hands of special rocket artillery troops and had been deployed overseas. The basic M-6 CX202-E2) rocket motor is also used as the lower stage in several of the ARGO-series of rocketsondes such as the EXOS and Javelin, both of these vehicles also using the basic Honest John fin assemblies. Color schemes: Few rockets can boast the varied number of color schemes used on the Honest John. This is because of the fact that so many different rounds were used for White Sands firings, where separate vehicles were often painted differently to provide identification on film records. In addition, different White Sands paint patterns were applied to aid tracking or data reduction for special test rounds where, for example, roll rate or attitude had to be accurately determined from phototheodolite film. Most R&D flights of the Honest John at White Sands were painted flat white overall. In nearly all cases, one fin and aft 34 inches of the motor casing were painted flat black as follows, the missile resting on the launch rail and being viewed from the rear: Upper left-hand fin painted black on both sides; the aft 34 inches of the motor casing painted black between the two left-hand fins. The black-and-white checkerboard roll pattern forward and aft of the nose ogive base was, on all rounds of this paint scheme, identical, the aft portion being alternately white and black in circumferential quadrants as shown in the photos (two black quadrants and two white quadrants) while the forward portion of the pattern is broken into eight circumferential sectors and positioned with respect to the aft pattern as shown. Rounds were also flown at White Sands painted fluorescent red-orange overall with blacked fins as per above, no blacked aft motor quadrants, but blacked trailing edges of all fins. Some of these had two spiral roll pattern bands wrapped halfway around between the forward and aft motor bands. Other fluorescent red-orange rounds had white ogives and transitions 105 inches back from the nose tip with blacked fins as per above. Operational rounds launched at Fort Carson, Colorado and Aberdeen Proving Ground, Maryland, were flat olive drab overall, sometimes with white serial numbering, sometimes with black serial numbering. Lettering on the white-and-black White Sands rounds was usually confined to the warhead serial number painted lengthwise on the ogive and consisting of the numbers "1236F-" followed by the serial number of the round such as "M585" or "M521". The word "TOP" in black appeared just forward of the forward launch lug. Sometimes the serial number of the motor and the weights, CG location, and other data was stenciled in black in 3-inch and I-inch letters on the side of the motor casing. 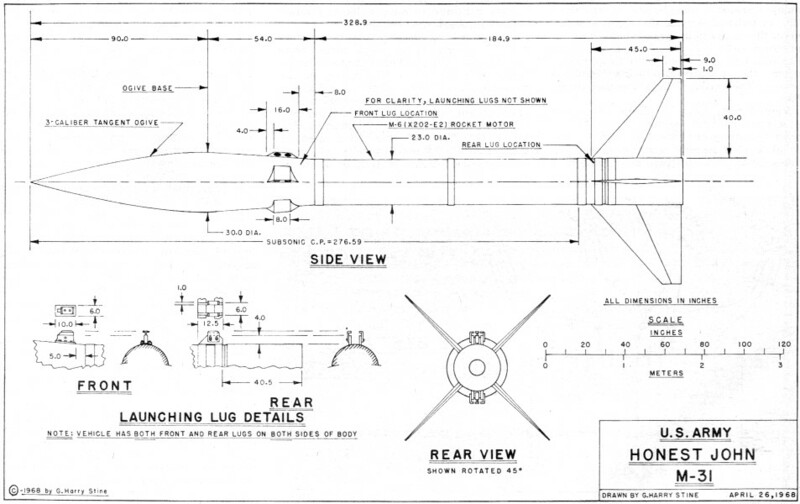 Dimensions of the missile: From personal measurements made by the author on the Honest John M-31 displayed at the White Sands Missile Range. Measurements made June 2, 1957. From fact sheets obtained at the Public Information Office, WSMR, in 1957 and June 23, 1966. From NASA Technical Note 0-219 dated December, 1959 describing the EXOS rocketsonde and giving dimensions and weights of the M-6 (X202-E2) rocket motor as well as basic performance. From "Sounding Rocket Study Summary Report No. AST/elR-13337," NASA Wallops Station, dated 18 April 1961, describing and giving weights and dimensions of the EXOS, Jason, Javelin and Strongarm with M-6 boosters. From various U. S. Army Ordnance photos taken at White Sands Missile Range and Aberdeen Proving Ground, and from various photos taken by the author. The author wishes to express appreciation to the late William Haggard and Gabriel Brilliante, Public Information Office, White Sands Missile Range, and to Robert L. Krieger and Charles S. James, NASA Wallops Station for providing the information used herein.